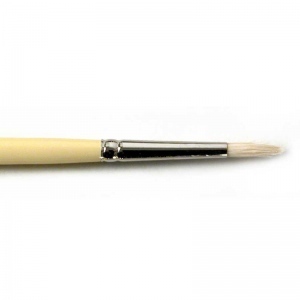 Kolibri bristle brushes are handmade in Germany by Feurer & Sohn—one of the oldest brush manufacturers in Germany (established 1898). 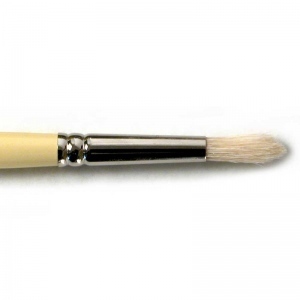 Natural Bristle Round Brushes are made from the finest Chungking (or Chongqing) unbleached hog bristles. What makes Chungking bristles unlike any other natural bristles is that they have a natural curve. 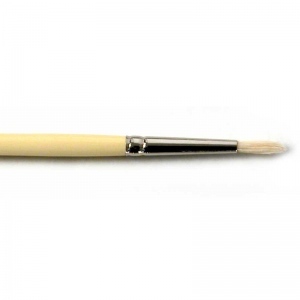 Each brush is hand crafted with "interlocked" bristles, meaning the natural curves of the bristles are positioned inward toward the ferrule, which gives the brush a natural resistance to fraying and spreads medium to thick paints smoothly and evenly. Natural hog bristles differ from other hairs because the tips of the bristles have split ends or "flags". 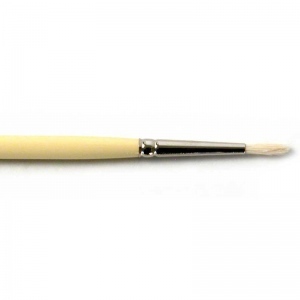 The flag allows you to load more paint on the bristle brush and provides smoother brushing.